There is something so humbling about working with a new medium, it lets you know right where you stand! For me at the beginning of the learning process ~ especially when painting a wave rushing toward the shoreline after a storm. Surging, an acrylic painting (6.5 x 10) painted on a hardboard that was prepared with a raw sienna ground to give the overall scene a warm tone. Three colors were used in this piece ultramarine blue, raw sienna and payne’s gray, and white for toning down. The two compliments were selected for mixing my own gray to stay with the stormy mood theme. Over the next several days I’ll be back to studying rocks and waves. Hope you have a wonderful weekend ~ click onto the image for a larger view. My interpretation of a reference image taken by Andre Van de Sande, an incredible photographer with pmp. This entry was posted in Acrylic Paintings and tagged acrylics, art, fine art, ocean, painting, Seascape, wave. Bookmark the permalink. Your waves have wonderful movement, and I love the mixture of colours. Thanks Sylvia – I was really going for the grey cast that comes with a storm and just wanted to go for a macro scene of a rushing wave. Love the movement of the waters upon the shore…I clicked on the painting to enlarge it and I found your brush strokes so perfect! Awesome Johannis that you opened the image – thanks very much and glad you enjoyed seeing the piece up close. I can’t recall if I replied earlier, life has been a little chaotic. I have to tell you, I can feel the seaweed. Excellent piece. Love your response – the “seaweed!” That’s great and awesome that you connected in that way with the piece. Thanks so much Joanna! Oh good. When I first looked at this picture, the waves coming into shore, I don’t want to say grey but the earthier (don’t think that’s a word) colours, reminded me of when I was a child and our family would walk along the beach. Where I’ve grown up on Vancouver Island our beaches are rugged, lines of washed up seaweed and driftwood, and I remember the white frothy waves that would wash seaweed onto the shore. You have painted a lovely piece, and that’s what I love about art, the memories a picture can stir up. And now I’ve really enjoyed your description for your response – no better compliment than to have a painting bring back wonderful childhood memories. Living by Lake Ontario had much of the same thing along the lake front, from the driftwood, to the seaweed, and wavelettes rushing to shore – similar memories of big bodies of water. Thanks so much, I loved reading about your childhood memories – wonderful vivid description. Thank you so much and very nice to meet you! A wonderful study of the waves. Great force in the wave Mary! Pretty great, Mary! Hope your weekend’s a blast, too! Wonderful advice and beautiful feedback Marina. I can’t agree with you more, especially with the ease of wet paint with the flow of a brush – in a word you are so right, it’s been freeing and I can’t wait to see where this takes my work. Hope a wonderful week ahead!! Have you ever tried oils? Do you use a retarder when you use acrylic paints, or just go with the flow as is? Thanks Pauline. I haven’t tried oil yet, one of these days but not excited about the smell and turps mess. Good question on the retarder – I just purchased though DickBlick and waiting for it to arrive. So far what I’ve painted has been just with the flow of the actual paint and some drips of water. Cleaning up is also simple… soap and water! The smell isn’t nearly as bad, as you aren’t using the harsh chemicals… but the pigment/oil will create a mild odor, so you’d like to be in a room with an open window, ideally. They’re really quite a pleasure to use! Thanks for the information Pauline, I’ll definitely keep this in mind and make note. I’ve heard many positive comments about water-based oils. Thanks very much Laura such a beautiful compliment – appreciate your wonderful feedback. Complementary colors and a tempestuous tumult. Very energetic, Mary. I see an eyeball too. 🙂 The sienna adds nice depth to the greys, blues, whites. Beautiful, Mary. Have a great Labor Day weekend. Thank you so much Geralyn! You see it too?! Oh no, I can’t take it out, lol!! The “eye” of the storm wave – how funny. You are so right about the sienna, giving a nice warmth and depth to the scene. Hope you have a lovely long weekend. Thank you for your lovely comment – nice to meet you! I am enjoying watching you work this new medium as much as I believe you are enjoying using it. Fantastic….Janet. Thank you Janet – the medium has sparked a whole new interest in how I handle subjects with paint brushes and mixing my own colors. A lot of fun! Mary, I love it! I struggle with acrylics which is probably why I keep working with them… and all the other watermedia. They’re fun AND challenging at the same time, if possible. I love payne’s gray, it’s lovely and not at all gray!! You too for a happy weekend! Thank you so much Linda. I’m fascinated by these acrylics – I like them and what I find the most enjoyable is that I can paint right on top of areas that aren’t working out. Unlike in oil pastels, where scrapping would be involved and then continue to paint only if tooth remains. Like you said, it’s fun AND challenging. I read recently that payne’s gray is an awesome backdrop to shadows in seascapes and marine scenes, I have to agree totally there is a cool beauty in the color. Thanks Fabio, like your description!! Thank you Cynthia. I was loving the soft grays that were developed by the two complements, they worked in illustrating the grayness of a stormy day. Oh that eye ball – how funny, I didn’t see “the eye” until Jill mentioned it. I love the surging of the waves here. Oh wow Mary, the power in this painting. Beautifully done. Thank you so much Emily – glad you enjoyed the scene. 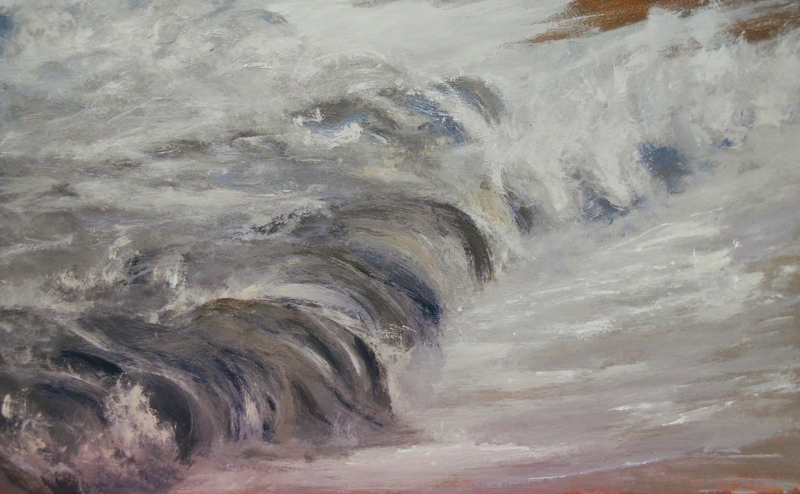 Love your description, it was my intention to show the drama and power of storm waves. They have a sense of order about them, fluid movement as they surge forward and drag back into the sea, and yet are elegant. The sea is magical. Awesome, Mary. You know what jumped out at me first…an eyeball. 🙂 Do you see it? Oh my, the eyeball jumped out at me! Good to hear Jill – bet this will be a life changing experience. Thank you Maniparna for your lovely thoughts on this scene. Hope you have a wonderful weekend as well!